So, today I am taking part in a slightly different blog tour where I am sharing my own experience as a blogger! So read on to find out all you need to know about the book and my thoughts on my experience of blogging. 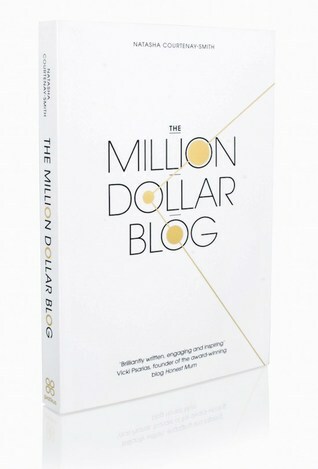 With practical advice and real stories direct from some of the most famous and successful bloggers in the world, The Million Dollar Blog is the first book to look at the blogging industry as it matures for 2016 and beyond. Blogging has become the 'it' career of the modern world and every business knows that blogging should be an integral part of their marketing and success, but it's actually never been tougher to be shine in the digital storytelling landscape. In this book, entrepreneur and digital strategist Natasha Courtenay-Smith covers practical and theoretical aspects of blogging. Through interviews with some of the world’s leading bloggers, vloggers and content strategists, including Seth Godin, Grace Bonney, Grant Cardone, Chris Brogan, Guido Fawkes, Heather Armstrong, Madeleine Shaw and Lily Pebbles, readers are also shown the philosophies, thinkings and strategies of the stand out stars in their field. Readers are given an overarching view and understanding of the blogosphere, the opportunities it contains for both individuals and business owners. No matter who are you - a mum at home, a budding fashion blogger, or a small business owner - you’ll learn the philosophies behind blogging, discover how to harness the power of content to increase your profile, create new opportunity, earn money and become better known. I have been blogging on Bookaholic Babe for just under four years. It isn't my first go at being part of a blog/website, I started out as part of an amazing team of ladies who ran the fansite RobertPattinsonUK. The years I spent as part of that site were amazing. Those ladies were, and many of they still are, like family. I guess that's why one of my favourite things about blogging is the sense of community and the sense of friendship! I am lucky in that I have never really faced any animosity since I opened my blog but I know people who have and I hate that but thankfully it doesn't occur too often. I had to leave the fansite due to work constraints but I missed being part of something like that which is why I decided to open Bookaholic Babe. I read a lot on my commute so it made sense to start a book review blog and I had already been rating on Goodreads so it seemed a natural progression. It also helped that I already had some experience writing reviews. I love being a blogger and being a part of the book reviewing community. We all band together, help each other out and look out for one another and out blogs. When I first started I was worried about getting on the radar with authors and PR companies, worried that the fact I was a fledgling blog would work against me. I was so wrong! I signed up for many PR companies and took part in blog tours to get my little blog out there. I have spoken to numerous authors and become very close to two in particular who are the authors of some of my favourite books and series. Natasha Courtenay-Smith is an entrepreneur, digital strategist and business mentor. Clients include celebrities, business owners, thought leaders, health practitioners, experts and all round ambitious talented individuals who want to build their brand online and become better known for what they do.